Can you imagine what would happen if Australian scientists discovered 100 new species of whales and dolphins in our seas? The wires would be buzzing with the news. It's not whales and dolphins that have been under the scrutiny of the scientists, but those more ancient and mysterious ocean predators, sharks and their close relatives, rays. Over the last year more than 100 new species have been unveiled by CSIRO scientists. Many are rare and elusive, or live in remote and isolated places like the Coral Sea, a world-renowned marine predator hotspot. While the scientists in Hobart are busy adding to the list of Australia sharks and rays and advancing the understanding of the top marine predators in our waters, fisheries managers in Brisbane are drawing up plans to issue licenses for the taking of hundreds of tonnes of sharks from the Great Barrier Reef Marine Park. As science furthers our knowledge of these key ocean predators, managers are planning more dedicated shark fisheries - it is like we are writing the fineprint on the headstone while we send them to extinction, and it is literally playing out before our eyes. The state of nature reflects a government's ability to manage responsibly for future generations. Fisheries are a classic example of a renewable natural resource that is difficult to manage responsibly. At worst, in the absence of management, there is serial depletion as the 'tragedy of the commons' takes hold, with the highest value species vanishing first, followed by the next most valuable and so on. Even where management structures are in place, decision making can often be characterised as being driven by delusional optimism, based not on precautionary science but on the need to appease industry stakeholders. The result is the same, with stocks dwindling and fishers switching to different products as high value species vanish. Sharks provide early warnings of this type of effect. While their fins command a high price on the seafood market, their slow reproductive rates - more akin to whales and dolphins than fish - mean populations are slow to recover from fishing. As a result, sharks are literally vanishing from our waters. While the CSIRO adds new species to the list, the sharks we already know about, like the hammerheads, thresher sharks and makos nudge closer to extinction. This is the inconvenient truth about sharks globally. It is against this global backdrop that Queensland has proposed to start a dedicated shark fishery including the waters of the Great Barrier Reef Marine Park, in an act not dissimilar to allowing the deliberate hunting and removal of hundreds, if not thousands, of lions, leopards and cheetahs from the great natural parks of Africa. The Queensland Government should abandon its plans for a dedicated shark fishery and instead concentrate on the much greater opportunities for revenue through tourism, and on its global responsibility to protect their dwindling populations. 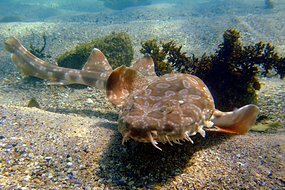 This would mean halting fishing on at-risk shark species such as hammerheads, and putting conservation measures first, such as protecting those maternity wards and nursery grounds where those sharks come to breed, the same grounds that would be targeted by fishers seeking baby sharks. A more responsible approach would also mean capitalising on the fact that a shark caught in the lens of a tourism diver is worth far more than the same shark caught in a hook or net, destined for a bowl of soup or a grocery store shelf, and investing in dive-based tourism. Out in the Coral Sea, divers pay thousands of dollars to catch a glimpse of a school of sharks in the wild. Compared to the tens of dollars per kilo retail price for sharks caught and landed on a commercial fishing - it is evident that it makes both economic and ecological sense to protect sharks. Australian governments often lay the blame for shark declines on foreign fishing vessels, while turning a blind eye to the weak management of domestic shark fisheries and inadequate controls and data to ensure sustainability. Many Australians would be surprised to learn that we now have the dubious honour of being in the top 25 shark-catching nations on the planet, with kilometres of gill-nets set along our coast every year to service the shark trade. Let us celebrate the discovery of 100 new Australian shark species - but as a nation that claims to be a world leader in marine conservation, let us say no to the taking of hundreds of tonnes of sharks from the Great Barrier Reef Park. It is simply not acceptable.